The vast majority of Road Diets are installed on existing pavement within the right-of-way. Identifying the objective(s) will help determine whether the Road Diet is an appropriate alternative for the corridor that is being evaluated. Driveway density, transit routes, the number and design of intersections along the corridor, as well as operational characteristics are some considerations to be evaluated before deciding to implement a Road Diet. One of the primary reasons for a Road Diet installation is to address an identified crash problem. Four-lane undivided highways have inherent design aspects that make them susceptible to crashes. Left-turning and through movements sharing a single lane contributes to rear-end crashes, left-turn crashes, and speed discrepancies. In most cases, current four-lane undivided cross sections do not include accommodations for bicyclists, and most have no refuge for pedestrians to cross four lanes of traffic. When a Road Diet is considered for safety reasons, practitioners must determine if the crash patterns are those that can be addressed with this alternative. More than 600 State, regional, and local jurisdictions have adopted Complete Streets policies or have made a written commitment to do so. The project satisfies the purpose and needs as agreed to by a full range of stakeholders. This agreement is forged in the earliest phase of the project and amended as warranted as the project develops. The project is a safe facility for both the user and the community. The project is in harmony with the community, and it preserves environmental, scenic, aesthetic, historic, and natural resource values of the area. The project exceeds the expectations of both designers and stakeholders and achieves a level of excellence in people's minds. The project involves efficient and effective use of the resources (time, budget) of all involved parties. The project is designed and built with minimal disruption to the community. When considering whether to implement a Road Diet, part of the practitioner's evaluation process should include whether it will meet these qualities. The concept of Complete Streets is similar to CSS in that it suggests that the street network should be planned, designed, maintained, and operated in a way that accommodates all road users and those who use the surrounding environment; not doing so will result in "incomplete" streets. The concept impacts the planning and design phases of a roadway as well as the day-to-day operations. What it means for a street to be complete is inherent to the context and will differ depending on how the street is intended to function, what types and volumes of road users it should accommodate, the destinations it serves, and the right-of-way available. Many communities have embraced this concept by adopting Complete Streets policies, establishing the expectation that all future roadway projects will adhere to the principle that streets should be designed with all users in mind rather than simply providing enough capacity for vehicle through-put. To aid in implementing the policy, many communities are also developing Complete Streets design guidelines, which address the examples listed and other intricacies of how the design of a roadway should relate to the surrounding context. Consider the following common operational issues when determining the feasibility of a site for a Road Diet. The traditional definition of a roadway function is based on vehicular mobility and access. The functional goal for a potential Road Diet corridor should consider impacts on the mobility and access of all road users. Practitioners should also consider the adjacent land uses along a corridor. For example, a Road Diet is likely to succeed operationally if the roadway is already operating as a "de facto three-lane roadway." A de facto three-lane roadway is one in which the left-turning vehicles along the existing four-lane undivided roadway have resulted in the majority of the through traffic using the outside lanes (see Figure 11). The overall objective of the Road Diet is to match the design with the intended or preferred function of the roadway for all road users. Road Diets can reduce speed differential. The case study and simulation results of operational analyses from Converting Four- Lane Undivided Roadways to a Three-Lane Cross Section – Factors to Consider show that 85th percentile and average speed along conversions are likely to decrease by 3 to 5 mph.24 Anecdotal evidence from several case studies has shown that this type of conversion can result in lower vehicle speed variability. Level of Service (LOS) is a qualitative measure of traffic conditions using a quantitative stratification of a performance measure or measures. Consider LOS for two components: intersections and arterial segments. Corridors with closely spaced signalized intersections may have a larger impact on the Road Diet operation due to queuing affecting adjacent signalized intersections. This impact could be mitigated by signal timing and coordination between adjacent signals, allowing the corridor to be "flushed" with each green cycle. The City of Lansing, Michigan, goes a step further, considering updates to everything along a new Road Diet corridor, including potential changes to traffic control (e.g., signal removal, roundabout installation). The LOS on urban arterials would provide a more accurate view of conditions for roads with longer distances between signalized intersections or no signalized intersections in the corridor. The arterial LOS as measured by vehicle speed is affected by signal spacing, access point frequency, number of left turning vehicles, and number of lanes. The difference in delays and queues should also be considered when determining the feasibility of a Road Diet conversion. After the conversion, the through vehicle delay due to turning traffic should typically decrease. The delays for left-turning vehicles, however, may increase because a similar through volume is now using one through lane rather than two. Through-vehicle delay and queuing along the main line and minor street approaches may also increase and should be considered during detailed analysis of this type of conversion. Once again, the difference in these measures can be small if the existing four-lane undivided roadway is generally operating at or close to that of a de facto three-lane roadway. Several measures that also can be used to mitigate and minimize these operational impacts include, but are not limited to, signal optimization and coordination, turn lane additions, and driveway consolidation. Of particular interest and focus should be minor street delays and queues at signalized intersections and the available gaps at unsignalized intersections or driveways. Practitioners should consider the mitigation of any negative impacts during the more detailed alternative analysis and evaluation and weigh them against benefits for non-motorized road users. Practitioners should consider user quality of service for individual intersections and arterial segments as well as the overall facility. New methodologies for urban street facilities in the 2010 Highway Capacity Manual (HCM) allow analysts to determine quality of service measures for automobiles, pedestrians, bicyclists, and transit. There is often concern about apparently reducing the capacity of a four-lane undivided roadway in half by converting it to a three-lane cross section with a Road Diet. Practitioners have found some cases of the four-lane undivided road operating as a de facto three-lane roadway due to turning movements and driver behavior. Therefore, the effective capacity reduction is much less than the theoretical reduction assumed before implementation. Some of the following general trends are expected. Pedestrian LOS scores are likely to improve due to the lane reduction, speed reduction, and the reallocation of traveled way width to bicycle lanes and on-street parking. Bicycle LOS scores will improve as a result of some of the same factors, as well as the addition of a bicycle lane. Applying a Road Diet configuration on a corridor with frequent signalized intersections will have a larger impact on automobile operations than it would on a corridor with more infrequent signal spacing. Frequently spaced signals are more likely to have queued traffic back up into adjacent signals' effective areas, causing congestion issues at multiple intersections. In some cases this impact can be mitigated by optimizing the signal timing and coordinating between signals. The arterial automobile LOS will provide a more accurate view of conditions when there are longer distances between signalized intersections or only unsignalized intersections in the corridor. The following factors will affect automobile LOS, as measured by vehicle speed: signal spacing, access point frequency, number of left-turning vehicles, and number of lanes. The ADT provides a good first approximation on whether or not to consider a Road Diet conversion. If the ADT is near the upper limits of the study volumes, practitioners should conduct further analysis to determine its operational feasibility. This would include looking at peak hour volumes by direction and considering other factors such as signal spacing, turning volumes at intersections, and other access points. Each practitioner should use engineering judgment to decide how much analysis is necessary and take examples from this report as a guide. Knapp, Giese, and Lee have documented Road Diets with ADTs ranging from 8,500 to 24,000 vpd.37 The FHWA advises that roadways with ADT of 20,000 vpd or less may be good candidates for a Road Diet and should be evaluated for feasibility. Figure 12 shows the maximum ADTs used by several agencies to determine whether to install a Road Diet. Road Diet projects have been completed on roadways with relatively high traffic volumes in urban areas or near larger cities with satisfactory results. The peak hour volume in the peak direction will be the measure of volume driving the analysis and can determine whether the Road Diet can be feasibly implemented. 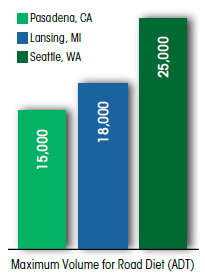 This is the traffic volume that would be used in calculating LOS analysis for intersections or the arterial corridor. Probably feasible at or below 750 vehicles per hour per direction (vphpd) during the peak hour. Consider cautiously between 750 – 875 vphpd during the peak hour. Feasibility less likely above 875 vphpd during the peak hour and expect reduced arterial LOS during the peak period. The volume and pattern of turning vehicles influences roadway safety and operation. Practitioners should assess turn volumes and patterns when considering the feasibility of a Road Diet conversion. In general, four-lane undivided roadways begin to operate in a manner similar to a three-lane roadway as the number of access points and left-turn volumes increase. In this situation the four-lane undivided roadway begins to operate as a de facto three-lane roadway and the operational impacts of a Road Diet conversion may be smaller. This type of situation, if expected during the entire design period, would be more likely to define a feasible Road Diet conversion location.39 If it is determined that the four-lane undivided to three-lane conversion is a feasible option along a roadway corridor, a more detailed operational analysis of the existing and expected through and turning volumes is necessary (see Chapter 4). The operation of each corridor is unique and requires an evaluation to determine if a Road Diet cross-section conversion is feasible. For example, if a major driveway exists along the corridor, it could change the potential impacts of a Road Diet by introducing another (often closely-spaced) opportunity for additional vehicular turning movements. If motorists are trying to turn into driveways opposite each other, opposite-direction vehicles could end up in the TWLTL and have potential conflicts. Offset intersections can cause a similar problem, as vehicular left-turning traffic can enter the TWLTL from opposite directions, desiring the same space from which to make their turn. Depending on the design of intersections and driveways, along with the volume of left turning traffic, this can result in potential conflicts. The number and frequency of slow-moving and frequently stopping vehicles using a roadway corridor is a factor to consider when evaluating the application of a Road Diet conversion. Some examples of these types of vehicles include agricultural equipment, transit buses, curb-side mail delivery, trash pick-up, and horse-drawn vehicles. These types of vehicles have a greater impact on the operation of a three-lane roadway than a four-lane undivided roadway. The primary reason for this increased impact is the inability of other vehicles to legally pass frequently stopping or slow-moving vehicles. When determining the feasibility of a Road Diet conversion, practitioners should take into account the number and duration of vehicle stops along the corridor (particularly during peak hours), as well as the enforcement levels needed to deter illegal passing. One potential mitigation measure to minimize the impact of frequently stopping vehicles is to provide pullout areas at specific locations along the corridor. Another potential mitigation is to use some of the existing cross section for these types of vehicles (e.g., a transit lane). Improvements to intersection and driveway radii or pavement markings to serve these types of vehicles should also be considered if the Road Diet is selected as a feasible option. Simulated comparisons of a quarter-mile, four-lane, undivided roadway with a three-lane roadway, each having different percentages of heavy vehicles, one to two bus stops, and various headways and dwell times (with a set amount of entering volumes, number of access points, and turning volumes) showed that the impact of these vehicles on average arterial travel speed was much higher along the three-lane cross section than that of the four-lane undivided roadways.40 Vehicles illegally passing stopped or slow-moving vehicles in the TWLTL did not appear to be a regular problem in the Iowa case studies. If this does occur, consider enforcement and education about the use of TWLTLs as appropriate. Embarking on a Road Diet presents an opportunity to dedicate more space to other roadway users and create a more balanced transportation system. For bicyclists in particular, Road Diets often include adding bicycle lanes to a street with little or no accommodation for bicyclists. The bicycle lane makes that route an option for many who would have been too intimidated to use the street previously. For pedestrians, Road Diets help reduce vehicle speeds and speed discrepancies midblock, making crossings easier and safer.41 Transit vehicles may find more space available for bus stops but may also face new challenges, such as blocking the single through lane along a corridor when stopped. Freight operators have special needs, especially for delivery of goods to businesses, that should be accommodated along the corridor. If corridors have existing or planned transit routes, the interrelation between transit operations (e.g., number of dedicated stops and frequency of trips) and other roadway users (i.e., vehicles, bicycles, pedestrians) should be assessed before determining whether or not to implement a Road Diet. The following sections present considerations and examples of how Road Diets may be implemented with pedestrians, bicycles, transit, and freight operations in mind. Bicycle routes should be part of an overall network. One of the things to consider when determining whether a street is appropriate for a Road Diet is whether it fills in a gap in the overall network, or if it is part of a planned network. Many agencies, including the Los Angeles, Seattle, and Chicago DOTs, have sought out potential locations for Road Diets to complete the networks identified in their bicycle master plans. If a formal bicycle network has not been identified, the roadway in question may still benefit from bicycle facilities. The street should first be studied to determine if there is any existing bicycle activity along it. If bicyclists are already using the roadway without a facility, significantly more bicyclists will likely use the route after a Road Diet. Whether or not there is existing activity, demand for a bicycle facility should be estimated. In cases where there are already bicycle facilities, a Road Diet may be an opportunity to further enhance the comfort of bicyclists by adding buffer space or converting a standard bicycle lane to a protected bicycle lane. Adding buffers may have additional benefits to other users as well. For instance, where the goal is to lower speeds, adding buffers to narrow travel lanes may accomplish that, which would be a benefit to pedestrians as well as bicyclists (see Figure 14). The primary items for consideration for pedestrians are similar in nature to those for bicyclists – is there already a sidewalk available; what is the level of pedestrian activity; could the activity be expected to increase with the addition of facilities? If there are no sidewalks currently lining the roadway, designers should consider adding them with the Road Diet. In rural contexts, a sidewalk may not be necessary, but in these situations, a paved shoulder should at least be considered as a pedestrian accommodation. 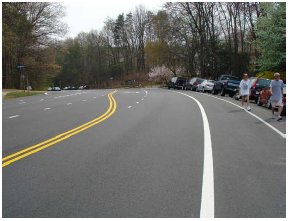 Along a section of Soapstone Road in Reston, Virginia, a Road Diet converted the road from two travel lanes in each direction to one lane of travel and a bicycle lane in each direction, separated by a TWLTL. Pedestrians can be observed walking in the road at locations that lacked sidewalks near the transition into the three-lane section, as shown in Figure 15. In this case the Road Diet treatment provides a safety benefit by increasing the separation between pedestrians and motor vehicles. The history of pedestrian crashes should factor into the decision as to whether to implement a Road Diet and what the components of the Road Diet ought to be. Crashes can be reduced by adding sidewalks or a shoulder, adding pedestrian refuge islands, and simply by slowing cars and reducing the number of lanes pedestrians must cross. Pedestrian refuge islands should also be considered. The land use and the intended pedestrian environment will also factor into the decision as to whether to implement a Road Diet. It is important to consider transit operations along a corridor being evaluated for a Road Diet, and also to consider the impacts of new transit needs that affect all road users. The conversion should not result in transit causing undue additional delay to general purpose traffic, though in many cases buses that stopped in the rightmost through lane before the conversion will stop in the only through lane after the Road Diet is installed. Bus stops are typically located along the curb with on-street parking removed, although some corridors may include pull outs to prevent buses from blocking through traffic. Pull-outs are often not preferred by transit operators due to difficulties with ingress and egress from the mainline. Agencies should work with transit providers in the corridor to make sure their needs are being addressed. This is also a good time to have the transit provider look at bus stop spacing and location. Some stops could potentially be eliminated or moved from either near-side or far-side locations at intersections to provide a better pedestrian connection or to prevent buses from blocking the line of sight between pedestrians and motorists. If buses end up partially blocking the through lane after a Road Diet conversion, then vehicles may end up passing the bus in the two-way left turn lane. This issue can be remediated by applying physical barriers (e.g., channelizing devices along the outer edge line of the TWLTL) to prevent the maneuver, depending on the frequency and severity of the violation. On 55th Street in Chicago, the City installed a Road Diet from Cottage Grove Avenue to Woodlawn Avenue. This corridor served as an existing transit route, and the City also wanted to incorporate bicycle facilities. Significant coordination with the Chicago Transit Authority was necessary to address the needs of the transit providers, while also accommodating the new bicycle lanes. 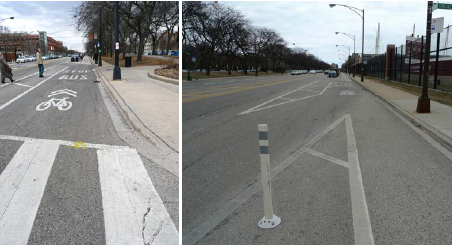 Figure 16 shows how transit and bicycle lanes are both accommodated on 55th Street. Bus priority at traffic signals. In-lane bus stops for transit efficiency. Pedestrian safety treatments for transit users and on-time bus service. The City of Seattle has a fleet of electric buses that use overhead wires to provide eco-friendly and cost-effective services. For a proposed Road Diet project on Myrtle Street, King County Metro asked if the bus could continue using the same overhead wires with the new lane configuration. If so, then the Road Diet would be a low-cost solution. If not, it would be very expensive to move the wires. After testing the situation they determined that the buses could reach the wires, so the Road Diet project was installed. There are instances where a corridor proposed for a Road Diet will need to accommodate truck movements. Freight operations on corridors are largely driven by demand-induced truck volumes, the proximity of alternative or parallel corridors, and the land use characteristics along or near the corridor. Freight operations can range from routine deliveries along the corridor to throughput of freight generated within and outside a region. When evaluating a corridor for a Road Diet, current and future freight operations should be considered. Current Land Use. Different uses generate different volumes and types of large truck movements. For example, restaurants may generate relatively high volumes of trucks, while lower density residential typically will not. Keeping the land uses along a corridor in mind will help agencies appropriately design Road Diets to meet local needs. Truck Size. Corridors that serve or connect to larger industrial properties may serve larger trucks that cannot easily maneuver on narrower roads. By contrast, commercial retail stores and offices are often served by smaller unit delivery trucks. Delivery Parking Areas. Some urban areas can accommodate deliveries via alleys or side streets, thereby avoiding trucks stopping on the main street to deliver. Other options include dedicated curbside delivery parking areas or off-street parking lots. Still other urban areas lack dedicated truck delivery parking areas, making it more difficult for delivery trucks to find parking and increasing conflicts for all users. Intersection Design. Intersections where large trucks are often making turns should be designed with wider curb radii to accommodate truck movements. Intersections that experience few truck movements, few truck turns, and/or almost exclusively serve smaller trucks have lesser intersection turning radii requirements. Engaging freight stakeholders early in the project planning and development process provides an opportunity to align freight mobility with the goals of a planned Road Diet. Outreach to stakeholders such as business owners, commercial and industrial property owners, and local carriers can be useful to identify potential issues with a Road Diet implementation. While engagement with freight stakeholders does not guarantee all conflicts will be resolved, it increases the likelihood of agreement on a Road Diet approach that balances freight mobility, safety, economic growth, and community needs to enhance quality of life. The feasibility of converting a four-lane, undivided roadway to a three-lane cross section as a possible alternative along a particular corridor can be evaluated, at least partially, through the consideration of several feasibility determination factors (FDFs), as discussed earlier in this chapter. If the existing or preferred characteristics of the FDFs match the objectives or goals for the corridor under consideration, the Road Diet configuration should be included as one option in a more detailed alternative cross-section analysis and comparison. Overall, Road Diet feasibility is tied to the ability to design the facility within the existing roadway cross section or right-of-way. However, in some cases, the corridor FDFs may require some mitigation to achieve a desirable outcome after a Road Diet conversion. The acceptability and impacts of this type of mitigation should be considered in general when determining the feasibility of the Road Diet option. A more detailed analysis would need to be completed when all feasible corridor cross section alternatives are evaluated and compared. Planning/policy, geometrics, safety, and operational details for Road Diets are discussed in other sections of this guide. The content of the discussion that follows was generally derived from Converting Four-Lane Undivided Roadways to a Three- Lane Cross Section: Factors to Consider. Other information has been added based on more recent research efforts and agency experience with Road Diet implementation and evaluation. Appendix B includes a summary table of feasibility factors, their characteristics, and a series of sample evaluative questions. Practitioners frequently consider the conversion of a four-lane, undivided cross section to three lanes when additional right-of-way or project funding is limited. Many Road Diet conversions can be completed within the existing curb-to-curb or roadway pavement envelope. However, changes in width at specific locations and occasionally additional right-of-way may be necessary (e.g., at intersections for right-turn lanes). A Road Diet conversion may be less feasible when these types of activities increase. In many cases a Road Diet conversion may only consist of changes in pavement markings. The inclusion of a Road Diet conversion as a feasible option for further consideration is more likely if there are limitations on available right-of-way. Road Diets can cause some diversion of traffic to parallel routes. A determination will be needed to establish whether the parallel routes would be desirable by through vehicle drivers on the corridor of interest. This can be established through discussions with those that travel the roadway or the application of appropriate simulation software. The distance between parallel arterials should also be considered. It is less likely that vehicles will divert to parallel routes that are farther away or that are just as congested. The other consideration is vehicles shifting to parallel non-arterial streets as "cut-through" traffic. Collecting before-and-after traffic data can inform the practitioner if this is occurring. Some community members may be more sensitive to this, so having data can help clearly define whether this is a problem. If there is an increase in cut-through traffic, traffic calming or other mitigation measures on parallel streets may be warranted. The existence of parallel parking (full-time or only during part of the day) and its impact on the feasibility of a Road Diet conversion should be evaluated. The difference in the impacts of the parking maneuvers on the four-lane undivided versus the three-lane cross section need to be compared. In addition, if a bicycle lane is added after the conversion, the interaction between bicyclists and vehicles being parked should be considered. Parallel parking can be and has been included along three-lane roadways. The use of 3D visualization may serve as an effective tool to help local stakeholders visualize a proposed Road Diet and assess impacts associated with the installation. Design visualization allows viewers to see the corridor from several vantage points, such as a commercial vehicle, a motor vehicle, a bicycle, or a pedestrian. An important consideration in the feasibility of converting four-lane, undivided roadway to three lanes is the existence of railroad crossings. Vehicles queued at an at-grade rail crossing will need to be served by one through lane after the Road Diet conversion. This could result in queues that are approximately twice as long. If this type of queuing is not acceptable along the three-lane cross section, it could affect feasibility. It is also important to consider at-grade crossings for railroads that closely parallel the corridor of interest. In the case of a nearby parallel railroad, the additional queuing due to a train would occur in the TWLTL in one direction and the through lane in the other direction. If operation of the converted corridor is needed while a train passes, the addition of a right-turn lane with adequate storage may be necessary for mitigation. The consideration of the signalization at these intersections (if it exists) also requires special attention both before and after the Road Diet conversion (if it occurs). Road Diet conversions have been implemented for more than three decades. Their implementation, however, can still be very challenging. This type of conversion is relatively unusual and new to most transportation professionals, local jurisdictions, and the traveling public. In some cases the consideration of or proposal for a Road Diet can lead to some concern due to unfamiliarity. A temporary trial basis implementation of a Road Diet conversion has been used to address public concerns. This approach requires the restriping of the pavement within the proposed Road Diet area for a period of time before a determination is made to continue with a permanent Road Diet installation. Temporary pavement marking materials similar to those used in construction work zones can be considered for this purpose. Consider signalization adjustments and any potential issues related to turning vehicles. During the trial basis time period, a series of before-and-after operational studies can be completed; some preliminary crash analysis can be performed; and surveys can be conducted among adjacent land owners, first responders, etc. If the trial yields positive results, consider implementing a more permanent Road Diet conversion. If it is determined that a Road Diet is not the best option for the corridor, the roadway can be changed back to its original lane configuration. 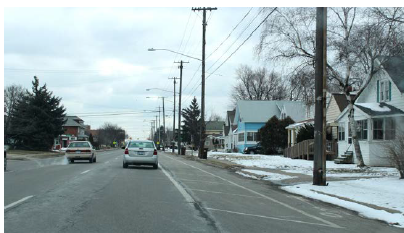 Michigan DOT (MDOT), with support from FHWA, has implemented Road Diets using the trial basis approach to appeal to communities where Road Diets may be feasible but are not embraced locally. In a few localities where citizens or local officials have objected to an MDOT-proposed Road Diet, MDOT has tempered its proposal with a guarantee: the agency will install the Road Diet on a trial basis, and will return the road to four lanes at the end of the trial if the community requests it. The evaluation criterion in this case is simple: what does the community want? As a result, many corridors have retained their Road Diet conversion with only two corridors being returned to four-lane undivided sections in Michigan. MDOT and FHWA believe that this is an effective approach to demonstrate the safety countermeasure to a community. Several agencies apply general "rules of thumb" when first considering Road Diets. This section summarizes the factors and design parameters agencies should use when considering a Road Diet. 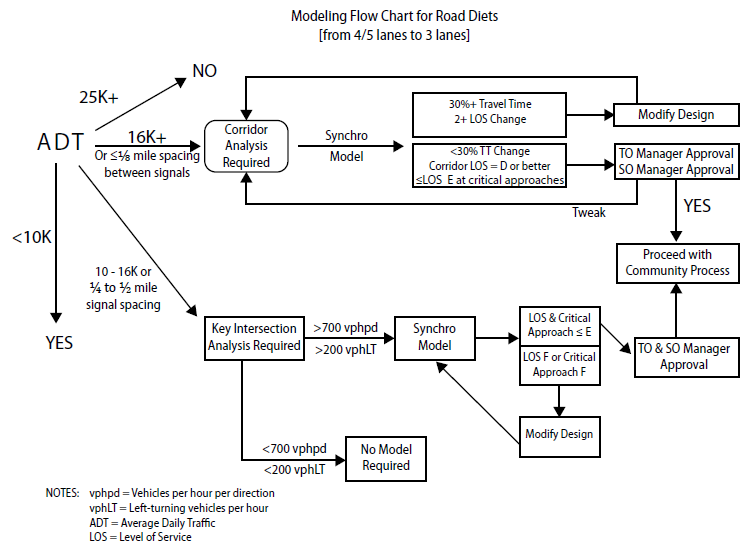 To guide Road Diet implementations, Seattle DOT developed the flow chart shown in Figure 17 to support its Road Diet decision-making process. First, the city calculates the ADT of the roadway segment in question, combined with signal spacing. In some cases this will lead to additional operational analyses of the entire corridor or key intersections. Depending on the results of this additional analysis, further modeling may be required (e.g., via Highway Capacity Software or Synchro). Those results may require modifications to the design to accommodate traffic. Once the simulation results are satisfactory, the Traffic Operations Manager and Signal Operations Manager must formally approve the Road Diet project to move forward. 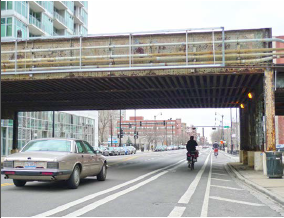 Chicago DOT (CDOT) has started developing guidelines for when and where to implement Road Diets at the time of this writing. Crashes are the most important reason for them to consider a Road Diet, followed by traffic volumes that do not warrant the current number of lanes. CDOT considers a roadway up to 15,000 – 18,000 ADT to be a good candidate for a Road Diet. However, the agency believes that the design hourly volume (DHV) may be a better parameter to use than ADT. A Road Diet would be feasible with a peak hourly volume of 1,000; at higher volumes, signal modifications may be necessary, and implementing left-turn phases is important where the traffic volumes are high. Planning and Policy – Includes information on the purpose and need for the Road Diet, planning considerations for the local community and regional planning agency, Transportation Improvement Program (TIP) processes, etc. Feasibility Determination Factors – Includes information regarding traffic volumes, traffic modeling, turning movements, level of service, crash analysis, etc. Operational Criteria – Includes information regarding acceptable Level of Service (LOS) and improvements related to certain crash types. Geometric Design Criteria – Describes maintaining proper geometrics using major road standards. Systems Considerations – Includes considerations regarding parking, pedestrian and bicycle issues, school routes, etc. Project Costs – Describes financial arrangements for cost-share projects. Michigan DOT has chosen to view all existing four-lane, undivided roads as potential implementation sites. 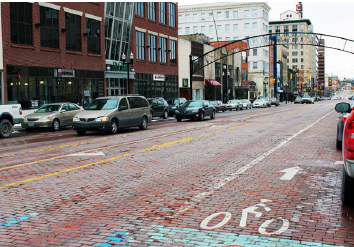 Many local Michigan agencies believe that a three-lane cross-section is the desirable road section compared to two-lane and four-lane undivided sections, and they actively work to identify which four-lane undivided roads are good candidates for Road Diets. 10-ft. turn lanes (left and right). This guidance was established based on the city's experience; at some vehicle lane widths the roadway encourages side-by-side traffic, and some bicycle lane widths can encourage parking. Where undesignated pavement width exists, the city paints a buffer zone between the travel lane and bike lane, as shown in Figure 18. This provides a buffer between vehicles and bicycle traffic and helps allocate unused pavement without creating wide lanes. The local agencies within the region first targeted routes with low ADTs that would allow for easy conversion and result in safety benefits; routes carrying 6,000 – 8,000 AADT were selected for the first conversions. After several conversions and positive public opinions of Road Diets, GCMPC began selecting implementation sites with higher volumes – up to 15,000 AADT. Crash types that may be mitigated by installation. Crash data. Rates of traffic crashes for sideswipe, head-on, head-on-left-turn, angle, rear-end, and rear-end-left-turn crashes that are higher than the average for roadways with similar functional classification can be a good indicator for compatibility. Lane width. Four-lane roadways with lanes widths less than 12 feet may be good candidates as the narrow lanes can cause conflicts for passing vehicles. Speed limits and operating speeds. A Road Diet may be beneficial where traffic calming is needed. Surface type. A road that has concrete on the inside lanes and asphalt on the outside lanes (or the other way around) may be a poor candidate as the difference in pavement color may be used to distinguish travel lanes rather than the painted lane markers. This is especially true during inclement weather events or evening/morning driving as a result of sun glare. ADT. GCMPC considers ADT less than 10,000 feasible, between 10,000 and 20,000 potentially feasible depending on site-specific conditions, and more than 20,000 likely not feasible. Number of traffic signals. This is one of the many factors used to determine compatibility and is site specific. Land use. A Road Diet may be beneficial on corridors that have a lot of turning movements such as a block-style street grid, shopping areas, school zones, etc. Overall, the efforts of GCMPC to install Road Diets have resulted in a number of installations. 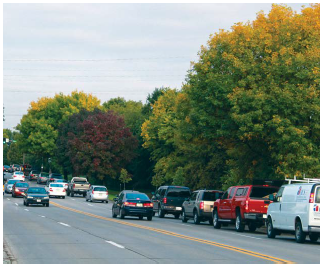 Four years ago, a Road Diet proposal from a local agency would have been unusual, but they are common now in GCMPC's annual call for projects. From the local agencies' standpoint, they feel that the extraordinary efforts of the planning agency and subsequent educational follow-up by GCMPC have facilitated implementation at the local level. Based on recent interviews with practitioners, agency considerations for Road Diet implementation are shown in Table 3. Road Diets can be funded from a number of different sources based on the needs of the agency. Road Diets are typically eligible for Surface Transportation Program (STP), Highway Safety Improvement Program (HSIP) or other Federal-aid funds where data support the expenditure. However, there are other benefits of Road Diets and other reasons for their installation, so the other funding sources available vary widely from Federal, State, and local sources. 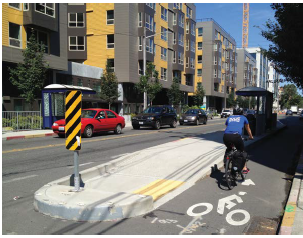 For example, the Seattle DOT (SDOT) has used funding from such sources as Safe Routes to School grants, Washington State DOT pedestrian and bicycle funds, and transit grants. The agency also monitors the city's road resurfacing projects to see whether upcoming streets scheduled for upcoming roadway overlay projects are good candidates for Road Diets. This allows Seattle DOT to use the annual paving program funds for some installations.